Website Advertising Bonus Effective Immediately and for a full year on our two Websites. Classified Ad: Up to 30 words for all advertisers - plus banners where applicable. 1. 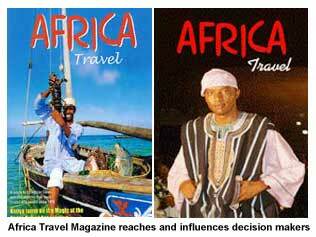 African National Tourist Offices: Targeted mailing lists, requests and worldwide event participation. African, U.S. and Canadian Embassies; African City Visitors and Convention Bureaus. Our greatest exposure ever at expos across North America and Africa. Kenya, South Africa,Tanzania, Ghana, Benin, Cameroon, Guinea, Côte d'Ivoire, Nigeria, Uganda, Zambia. 6. ATA Association Partners: ASTA, WTO, ARTA, CCA, IIPT, USTOA, TIES, SADC, AGOA. 8. Educational: Universities, Churches, Teacher and Student Organizations, Travel Training and Flight Schools. 9. Retail: Subscriptions via internet, plus bookstore and newsstand sales. Bulk orders, reprints and inserts for seasonal promotions.